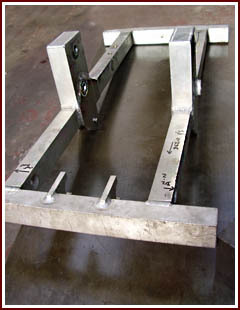 Megarweld Services provide Engineering Companies & Industrial Organisations and Manufacturers & Importers with Custom Made Short Run Fabricated Parts in Mild Steel, Aluminium and Stainless Steel. Megarweld’s Short Run Production Facility is ideal for manufacturers and importers wanting to create low volume adaptations to enable their products access to niche markets. For importers this has enabled organisations to buy high volumes at low cost, reducing the number of SKU’s while creating variants locally and subject to demand. The Short Run Production Facility can include Laser Cutting, Forming, Welding and other fabrication processes in order to ensure that the product and adaptation solutions are engineered to the highest quality. Low Volume Production in Mild Steel, Aluminium and Stainless Steel can be provided for the Architectural Industry, Electronic & Communication Market, Buildings & Construction, Automotive, Hydraulic & Petrochemical Industries and the Aerospace Industry. Megarweld's specialist stainless steel welding is ideal for stainless steel fabrications for the food industry. Call Megarweld Services of Wolverhampton on 01902 305 556 and speak directly to an experienced engineer; we are confident that we can find an engineering solution to your Short Run Production requirements. Marketing and Website Design D3. Website Design and eCommerce Solutions.